Beethoven’s late quartets propelled classical music into the future—they are widely regarded as among the most important works in western music and the pinnacle of Beethoven’s art. By turns profound, melancholy and exuberant, with a strong sense of striving towards some larger cosmos, these cherished quartets reward a close, live hearing. In this performance, the 13th Quartet Op 130 is presented with its original finale, the Grosse Fuge Op 133. 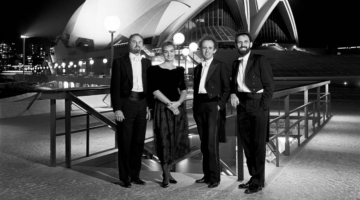 Melba Quartet is one of Australia’s most lauded chamber ensembles, made up of the musicians who worked together as the Australian String Quartet until 1996, establishing it as an important national and international ensemble.